I am not one for internet games. I have a handheld gaming device that I use on a regular basis. But I am not sure that would be considered so much a game as a logic puzzle, or my sudoku which most people would not consider very much fun. I also have a video game with word definitions and anagrams. Well, today I found another game, and I have been playing it for over an hour. 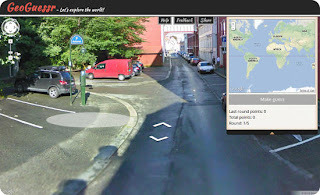 Geoguesser is geography game powered by Google. Basically you get placed somewhere on Earth, and you get to move around, down the street, left right, as if you were navigating Google maps (because you are). You continue moving about until you figure out what part of the world you are in. I am actually surprised how good I am at this. I mean, it would be easy to identify places I have actually been, but apparently all those detective games I have been playing on my Nintendo DS that has me find clues to piece together some sort of puzzle has paid off because I am coming within a mere few hundred miles of the actual location each time. Keep in mind I have the whole world to work with, so getting within a few hundred miles is pretty darn accurate. At first I was just aiming to be within the same continent and/or country. But now I am angling for actual cities. So far I have come close, but have only hit the city a couple of times (and only on the completely obvious ones). 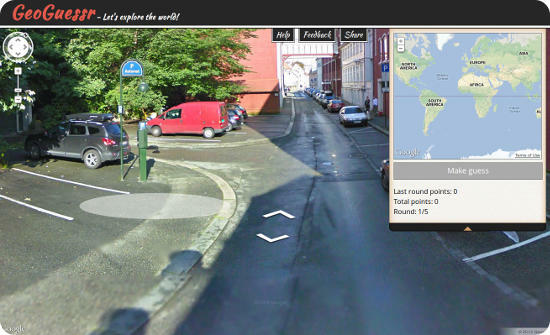 I found the easiest way is to look for street signs of any kind. While actual street names or even town names aren’t very helpful, it gives away the language. Also, any other type of signs are helpful (establishment names, sides of a bus, etc). If you can find a well known company, then you can pretty much guess the city if you know where it is, or come in extremely close. From there you can narrow it down by architecture and type of city. Rural? Suburb? Urban? Any water? Foliage? What kind of cars, if any? After a few rounds I started picking up on the more subtle things I should be looking for. For the last two rounds I have been within a hundred miles of the destination. If I ever get kidnapped and transported to a different part of the world, I should be able to figure out where I am by walking around on the street. Or I could just ask somebody. P.S. Shortly after I originally posted this a friend of mine messaged me to remind me I have no sense of direction. She is right, I don’t. I am not saying that I could ever find my way home from any of these places, but simply that I would be able to identify where I am. In fact, I couldn’t find my way out of a paper bag. *But* I would know that I am *in* a paper bag. And I think that is half the battle. So should I find myself in a strange land, I would simply find accommodations. What? I am in Tijuana? Well then I will just make myself at home.